Coleslaw is a perfect summer dish, and with the right recipe, it can be healthy. Our recipe uses colorful, nutrient-packed produce such as carrots, snow peas, and radishes. Carrots are rich in vitamin A, radishes have vitamin C, and snow peas contain vitamin C and vitamin K. And who can forget the tasty, low-cal cabbage? 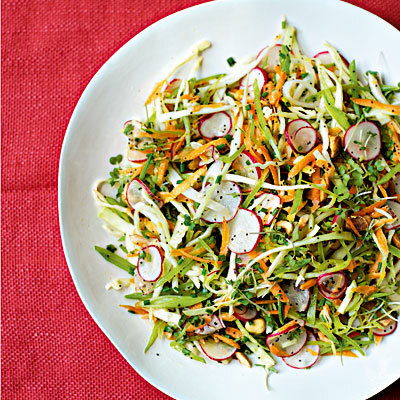 All together this slaw is just 185 calories per serving, so eat up! Ingredients: cabbage, carrots, snow peas, radishes, scallions, toasted hazelnuts, parsley, poppy seeds, lemon juice, hazelnut or extra-virgin olive oil, salt, black pepper.